Graphisch-statistischer Atlas der Schweizerischen Normalbahnen. Erstellt im Auftrage und unter Mitwirkung der Conferenz schweizerischer Eisenbahnverwaltungen von der Direction der schweizerischen Nordostbahn für die Schweizerische Landes-Ausstellung 1883. London 1883, Murray. Blue cloth, very good, 332p., index,. + 332p. text, index, color folding plate, foldout color map,. 1 map, 31 plates,pictorial gilt covers, head/tail spine wear. corner wear, several pages corners bent,mended, 2nd edition.. A VERY IMPORTANT, EARLY & SCARCE PRIMARY RESOURCE This comprehensive work covers the journey from Europe to Ava into Saigon. Up to Hong Kong, Shanghai, Tientsin to Peking. Hankow, the I-Chang River to Ch'ung Chi'ing. The French missionaries there, on to Tibet, brine & fire wells, Red Basin of Ssu-Ch'uan. * On to the Northern Alps, Ch'eng Tu, the frantic curiosity of the people, Sanga of the Himalayas, Min River, the road to Tibet, account of Ch'eng Tu. Local government of Ta-Chien-Lu, Lama Ambassadors. The Great Plateau, Tsanba, wild fruits, hot springs, green parrots, female decorations, arrival at Bat'ang. Hostility of Lamas, river of Golden Sand, Sha-lu, opium smoking, down the Mekong river to chain bridge. * Marches of the Kingdom of Mien to Burma. scene of murder Augustus Margary, Kakyen country, embark on Bhamo River, to Irawadi, welcome from English Agent a Bhamo.. *. A great primary source narrative, covering a long trek all around China, Tibet and into Burman jungles. Great reading! * CONDITION: The head/tail of the spine, corners is worn. Some pages in upper right corner were bent, some have been reinforced with acid free Japanese paper, some brittle, a 'withdrawn' stamp on first free endpaper, no other marks, sold "as is" not refundable, inquire for more details or photos if necessary. Else contents clean, complete. If you are unsure, please do not order this book. We do not ship on approval. *** BIBLIOGRAPHY Marshall 1343 * Yakushi G117 * ALWAYS S C A R C E ! * Color scans can be sent by email. Images displayed may not always be the exact photo of the copy in stock for sale at any given time. If you want to see the exact image of the book or edition in stock, please request this by email. . Photos of most of our books are posted to our . London: Smith, Elder, and Co.,, 1883-86. In twenty-six volumes. 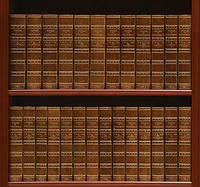 26 volumes, octavo (220 x 148 mm). Contemporary green half morocco, titles and decoration to spines, raised bands, green cloth boards, marbled endpapers, top edges gilt, others untrimmed. With numerous black and white illustrations throughout. Spines evenly mellowed to a pale tan, an excellent set. A handsomely bound and illustrated set. Die Überraschung" originales Ölgemälde auf Leinwand ca.44x62cm; unten rechts signiert und datiert "1883"
W.E. Dibble, 1883. First Edition. Cloth. Very Good/No Dust Jacket. 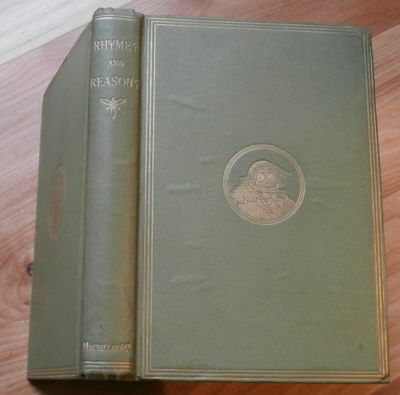 1st Edition: xvi, 840pp, illustrated, 200 engravings (illustrations and tailpieces). 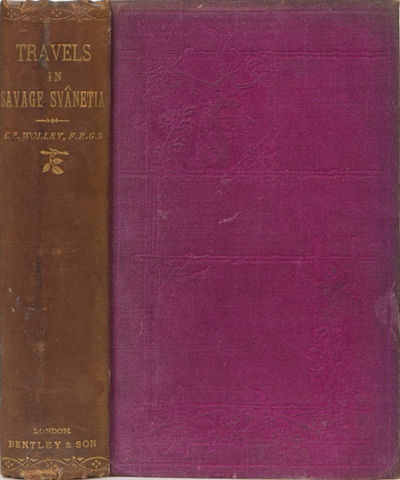 Original decorative red cloth covers with gilt titling to spine, floral eps, marbled page edges. Full Title: THE JEANETTE: And a Complete and Authentic Narrative Encyclopedia of All Voyages and Expeditions to the North Polar Regions, containing a complete account of the most remarkable examples of heroism, endurance and suffering on record. Embracing the biography of voyages of Franklin, Kane, Hayes, Hall and De Long. With an account of the development of Arctic navigation through the voyages of the norsemen, the cabots, Gilbert, Davids, Barentz, Hudson, Baffin, Behring, Mackenzie, Cook, Scorseby, Parry, Wrangell, Ross, Nares, Nordenskiold, Schwatka,Smith, Young, and many others; An accurate description of all important scientific and geographical discoveries ever made in the frozen North. A very rare title. Shelfware, spine sunned, eps split at hinge. Contents clean. Very Good PLEASE NOTE: This book will incur extra postage and insurance charges. Please contact us for a quote. Quantity Available: 1. Shipped Weight: Under 5 kilogram. Category: Arctic & Antarctic; Antarctic; Exploration. Pictures of this item not already displayed here available upon request. Inventory No: 2697. . This book is extra heavy, and may involve extra shipping charges to some countries. Hopkins, Sarah Winnemucca. Edited by Mrs. Horacer Mann. LIFE AMONG THE PIUTES: Their Wrongs and Claims. London Longmans, green and Co 1883. 3 Volumes. 8vo. 309pp., 312pp., 359pp. Bound in original publisher's mustard yellow glazed cloth, strikingly titled and decorated in black to spines and front boards (double headed Russian Imperial eagle, obviously). Minor shelfwear, a little rubbing here and there and light, inoffensive bumping to spine ends. Titles a little rubbed to vols II and III, nothing terribly significant; a clean, sharp and striking set of books, very good indeed. Internally clean, glazed yellow endpapers (where would late Victorian triple deckers be without glazed yellow endpapers. Ink ownership to pastedown of Vol I, ink stamp ("Lorinda B. Borstal" whom research has disclosed as either a 480 cargo barque based in Australia, or the lady after whom the barque was named, who according to passenger manifests frequently travelled in it, which for all I know is a persistent perk of having a cargo ship named after you. As yet no one has named a ship after me, I consider it only a matter of time) to front flyleaf of all three volumes. A very good, strong and attractive set indeed. A previous cataloguer, whose handwriting is absolutely that of the formidable and highly respected George Locke, has written "Russia. Nihilists and a Huge Explosion." on the verso of the front flyleaf of Vol I. Either his superior knowledge has identified this as a previously unknown sub-title to the work, or it's a brief run down of the plot. Basically Russian nihilists run amok, bombs go off and the authoress speaks sympathetically about the plight of Russian jews, which is unusual as one of her three other works has been considered more than atad anti semitic. Regardless, it is rather beautifully written ("her girl could not have a better watch dog than the honest, blunt young Englishman, to whom, she instinctively felt, every girl was as yet as sacred as his own sisters. As a matter of fact, Hudson had no sisters, being that risky prioduct; an only child. "), and seeing as the authoress (a London girl who married into diplomatic nobility) spent time travelling the more politically active parts of Russia, it probably isn't too far astray on the period detail, dealing as it does with assassination attempts upon the Imperial family. A stirring read. Scarce and attractive, which is how I'd like to be described. The Great East River Bridge With Entrance from New York Side. Burrow-Giles for Shugg Bros. New York ca 1883 - Chromolithograph, image 52 x 62.5 cm, framed and glazed. Large bird's-eye view of the Brooklyn Bridge with Manhattan entrance in the foreground and Brooklyn in the background. L\'Algerie. Histoire, conquete et colonisation. Ouvrage illustre de 4 chromolitographies, de 3 belles cartes en couleur et de plus de 200 gravures sur bois (Dont 22 hors texte). Kollationiert. Moondyne: A Story From The Under-World 1883 Edition "Signed"
[London: Daniel Giraud Elliot for the subscribers, 1883. Hand-coloured lithograph by J.Smit after Joseph Wolf, printed by M. & N.Hanhart. A very fine image from 'the best animal painter who ever lived' (Sir Edwin Landseer). The Bobcat, also known as Bay Lynx, ranges from southern Canada to northern Mexico. Named for their distinctive short, "bobbed" tails, they are approximately twice the size of a domestic cat. 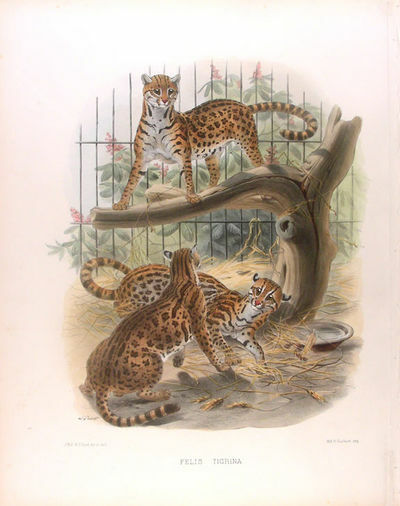 One of the most striking images from Elliot's magnificent work A Monograph of the Felidae or Family of Cats (London: 1878-1883) which described and pictured all the species of cats then known, and is still the most beautiful work on the subject. 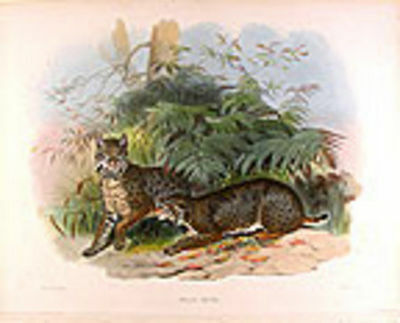 The work was prompted by a perceived need to resolve the confusion that had built up around the naming of the various species of Felidae , particularly amongst the smaller cats. Wolf worked from specimens provided by Elliot, who visited all the great museums and zoological societies on both sides of the Atlantic. This allowed Elliot to make a comparative study of skeletons and skins and reduce the number of apparently separate species by nearly a third. Joseph Wolf served an apprenticeship with a Koblentz firm of lithographers, and spent some time working in Leiden and Darmstadt, before moving to London in 1848. The quality of his images was recognized immediately and he was rarely without work, producing natural history pictures of the highest quality for the Zoological Society of London, Henry Dresser, George Gray and John Gould, amongst many others. Wolf's work for Elliot marks the high-point of his illustrative work and his images of the cats are considered by many to be his masterpieces. Cf. Nissen ZBI 1279; cf. Wood p.332. HISTOIRE DES JARDINS CHEZ TOUS LES PEUPLES DEPUIS L'ANTIQUITE JUSQU'A NOS JOURS . 1883. Hi, I recently purchased a set of Wisdens and the first 50 of the run were in a suitcase that had not been opened for over 50 years. This lot is an 1883 Original Paperback Wisden. It has the Original Spine Paper without any Restoration. It is in Very Good Condition for the year. The spine paper is excellent, just some wear to the ends and a small amount of darkness to the bottom. The book is very tightly bound, the covers have some marks and age toning , mainly to the front cover in the middle. Internally it is very nice and clean and hasn't been opened for a while. Spotting to page block but not much at all inside the book. No restoration. 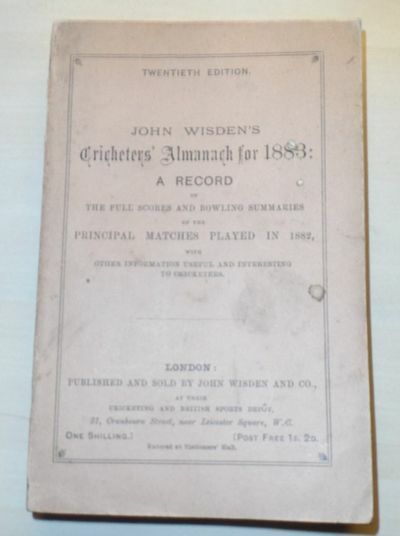 London: John Wisden & Co. VG : in very good condition without dust jacket as issued. Page edges browning. 1883. First Edition. Green hardback cloth cover. Modern rebind. 160mm x 100mm (6" x 4"). 284pp. 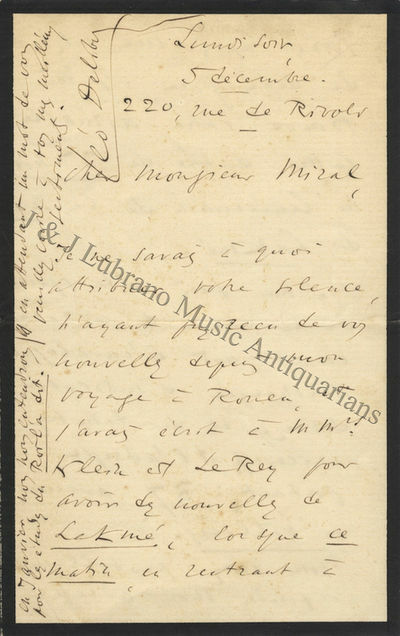 Original covers and adverts not bound in. .
Autograph letter signed in full to Monsieur Miral. 4 pp. of a bifolium. Small octavo. Dated Monday evening, December 5 [between 1883 and 1891]. In black ink on cream paper with black borders. In French (with translation). Having returned to Paris, Delibes is anxious for news of the second run of his opera, Lakmé. Because his correspondent's letter was delivered to the wrong address, he has had to seek information elsewhere. Unfortunately another audience member has told him that the tenor and "basse chantante" have weak voices. Delibes suggests they replace the latter with a certain "Monsieur Schmidt" in order to increase ticket sales. In January, he and his correspondent will discuss his opera, Le Roi l'a dit, which premiered at the Opéra-Comique on May 24, 1873. "Unfortunately a more recent letter...tells me that our tenor is always weak, as well as the 'basse chantante' [i.e. high lyric bass], and that the whole weight of the performance rests on Madame [Alice?] Verheyden, who alone has some success in the work. (I add that these reports do not come from her husband!)" Slightly soiled and foxed; creased at folds. . Lakmé is considered to be Delibes's masterpiece. It offers more than just a fine vehicle for a star soprano; the two principal male characters, Nilakantha and Gérald, are firmly drawn, and the music is melodic, picturesque and theatrically strong. The opera was first performed at the Opéra-Comique (Salle Favart) in Paris on April 14, 1883. Delibes's correspondent, Miral, was perhaps the director of the Théâtre Municipal de Nancy. If this is the case, it is quite likely that the production mentioned in this letter took place there. KOGYO ZUKUSHI: SKETCHES FOR ARTISANS. [Tokyo 1883, Ookura]. Stitched stiff wrs., very good, oblong. format, 18 x 12 cm., each bound in a different cover color,. profusely illustrated with pink, Sumi, black & grey colors,. 1-4 illustrations per page, 22+22+22+21 p., 4 of 5 vol. set.. An entirely enjoyable, light-hearted work, showing a profus- ion of good illustrations, woodblock printed, pastel colors. This kind of handbook was used by artisans who designed and carved Netsuke, made swords and sword furniture, textiles, lacquer, ceramics, Kimono & all other arts which required a design & good composition. * This work was done by the celebrated bird & flower painter & woodblock book & print artist who worked in the last part of the 19th century. This set illustrates a profusion of animal, heroes, comic characters, horses, genre pictures, deities, Gods, mythological characters, flowers, Samurai & military related horses & equipment, bugs, temples, holy places, religious objects, sages, toys, landscapes, Buddhist ritualistic articles, rivers, Kendo or sword- play matches, Shinto items, archery practice, ambush of a Ronin, tigers, monkeys & so much more ! * Kono Bairei 1844-1895 was a Maruyama school painter who studied under Nakajima Raisho & Shirokawa Bunrin a Shijo painter, thus he studied both of these great schools ergo the reason his works manifest such great control and precision, similar to Hokusai in his ability to tickle the viewer. Bairei is widely collected by world institutions and is well cited & illustrated in the usual reference books. * REFERENCES: C.H. Mitchell, p.371, with a good biography & list of his works listed on 14. * Color scans can be sent by email. Images displayed may not be the actual copy in stock for sale at any given time; if you want to see the exact image of the book or edition in stock, please request this by email and an image will be returned to you by attachment. * * * * BUY WITH . - 1883, livre accordéon de 25 estampes en couleurs au format oban 36 x 24 cms regroupant 50 oiseaux, par couple, en leurs milieux naturels , saison printemps/été. Les estampes, sur papier de murier, sont doublées de papier fin, les plats sont détachés et un peu salis, les estampes sont en bel état de fraicheur. BAREI KONO (1844-1895), illustrateur de livres japonais, essentiellement dans la représentation des oiseaux et des fleurs de l'ère MEIJI, professeur il dirigera une école d'art à Kyoto, à partir de 1880. Durm, Josef - Hermann Ende, Eduard Schmitt, Heinrich Wagner u.v.m. Handbuch der Architektur. 52 Bde. u. 4 Supplementbde., u. 1 Registerband. Der Schweizer Holzstyl in seinen cantonalen und constructiven Verschiedenheiten, vergleichend dargestellt mit Holzbauten Deutschlands. Erste Serie (zweiter Abdruck) und zweite Serie in 2 Bänden. [London: Daniel Giraud Elliot for the subscribers, 1883. Hand-coloured lithograph by J.Smit after Joseph Wolf, printed by M. & N.Hanhart. A very fine image from 'the best animal painter who ever lived' (Sir Edwin Landseer). A Central and South American cat, ranging from Mexico to Argentina, the Margay is similar in coloring and marking to the Ocelot, but is smaller. Elliott mis-identified this cat as Felis Tigrina, another South American cat. It is sometimes called the Tree Ocelot, they are agile in the forest canopy and sometimes spend their lives there. One of the most striking images from Elliot's magnificent work A Monograph of the Felidae or Family of Cats (London: 1878-1883) which described and pictured all the species of cats then known, and is still the most beautiful work on the subject. The work was prompted by a perceived need to resolve the confusion that had built up around the naming of the various species of Felidae , particularly amongst the smaller cats. Wolf worked from specimens provided by Elliot, who visited all the great museums and zoological societies on both sides of the Atlantic. This allowed Elliot to make a comparative study of skeletons and skins and reduce the number of apparently separate species by nearly a third. Joseph Wolf served an apprenticeship with a Koblentz firm of lithographers, and spent some time working in Leiden and Darmstadt, before moving to London in 1848. The quality of his images was recognized immediately and he was rarely without work, producing natural history pictures of the highest quality for the Zoological Society of London, Henry Dresser, George Gray and John Gould, amongst many others. Wolf's work for Elliot marks the high-point of his illustrative work and his images of the cats are considered by many to be his masterpieces. Cf. Nissen ZBI 1279; cf. Wood p.332. Fondements d'une théorie générale des ensembles [WITH] Sur divers théorémes de la théorie des ensembles de points situés dans un espace continu à n dimensions Contained Acta Mathematica 2:4. along with 5 other papers by Cantor. London: Richard Bentley, 1883. First. Hardcover. VG. Two vol in one as issued. 272 and 250 pp. Ill. A follow up to his former Sport in the Crimea and Caucasus. Continued hunting and travel through the areas in and around the Caucasus mountains from the Black Sea to Baku and even towards Herat. Very scarce. VG in original blindstamped cloth. Spine darkened by gilt readabvle. Little wear at spine tips. New York: Knoedler, 1883. Limited Edition. Hardcover. Near fine. Copy 19 of 600 on Holland paper. Folio. 120 pp. Covers in golden silk with silk ribbon (replacement) ties. Tail corners bumped, spine stabilized and reattached with new leather backing. Most illustrations with signature of engraver/artist and intact tissue. Tables of Modern Paintings, Ancient Paintings and Contents present at rear of volume. Text block tight and unmarked. Non-U.S. buyers: Please check with us on shipping fees BEFORE placing your order. [Chiswick]: Privately printed [by C. Whittingham], 1883. , 219pp, . Contemporary brown morocco, gilt, with armorial supralibros and titling to upper board. A.E.G., marbled endpapers.Slightly rubbed, spine a trifle faded. A rare privately-printed Victorian catalogue of the collection of the Earls of Ilchester, much of which was assembled by William Fox-Strangways, 4th Earl of Ilchester (1795-1865), diplomat and art collector. The work catalogues the works, often with extensive descreptions and notes of provenance, into their geographical location: at Melbury, Redlynch, Abbotsbury and 42. Belgrave Square. OCLC locates only three copies: at Getty, Oxford and NAL. . First edition. Quarto. Persian Poetry for English Readers. : Being specimens of six of the greatest classical poets of Persia: Ferdusi, Nizami, Sadi, Jelal-ad-din, Rumi, Hafiz, and Jami. With biographical notices and notes. 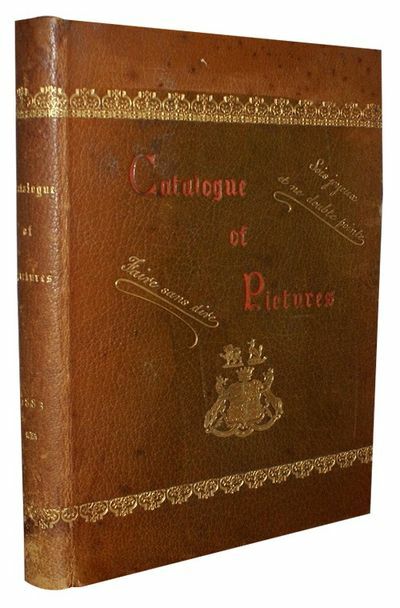 [No place]; printed for private circulation 1883 - A superb copy bound by Riviere and Son in full morocco. Spine faded. Armorial bookplate of Sir Chas. Chadwyck Healey of Wyphurst. - Lakmé is considered to be Delibes's masterpiece. It offers more than just a fine vehicle for a star soprano; the two principal male characters, Nilakantha and Gérald, are firmly drawn, and the music is melodic, picturesque and theatrically strong. The opera was first performed at the Opéra-Comique (Salle Favart) in Paris on April 14, 1883. Delibes's correspondent, Miral, was perhaps the director of the Théâtre Municipal de Nancy. If this is the case, it is quite likely that the production mentioned in this letter took place there. 4 pp. of a bifolium. Small octavo. Dated Monday evening, December 5 [between 1883 and 1891]. In black ink on cream paper with black borders. In French (with translation).Having returned to Paris, Delibes is anxious for news of the second run of his opera, Lakmé. Because his correspondent's letter was delivered to the wrong address, he has had to seek information elsewhere. Unfortunately another audience member has told him that the tenor and "basse chantante" have weak voices. Delibes suggests they replace the latter with a certain "Monsieur Schmidt" in order to increase ticket sales. In January, he and his correspondent will discuss his opera, Le Roi l'a dit, which premiered at the Opéra-Comique on May 24, 1873. "Unfortunately a more recent letter.tells me that our tenor is always weak, as well as the 'basse chantante' [i.e. high lyric bass], and that the whole weight of the performance rests on Madame [Alice?] Verheyden, who alone has some success in the work. (I add that these reports do not come from her husband! )"Slightly soiled and foxed; creased at folds. Debrois van Bruyck, Carl, Musikschriftsteller und Komponist (1828-1902). Eigenh. Musikmanuskript mit U. ("Carl von Bruyck"). Waidhofen an der Ybbs, 10. II. 1883. - 2 SS. Folio. Lied für Singstimme und Klavierbegleitung ("Mäßig bewegt"), überschrieben: "Letzte Strophe aus einer Anzahl von mir während eines [. ]übens fabricierter Verse", incipit: "So mist [!] Ihr mit liebenden Händen dereinst". - Der aus Brünn gebürtige Debrois war Anhänger Schumanns und "mit Hebbel befreundet, dessen Lieder er vertonte" (ÖBL I, 173). - Faltspuren. 1883. With Sixty-five Illustrations by Arthur B. Frost and Nine by Henry Holiday. London: Macmillan and Co., 1883. 1 page undated ads. Original light green cloth pictorially decorated in gilt. 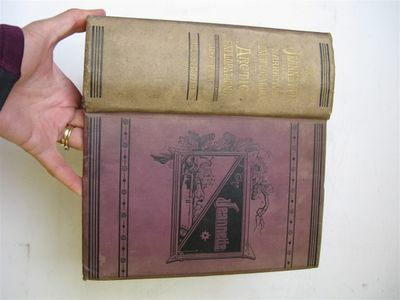 First Edition of Lewis Carroll's first major collection of verse (though some of the material had appeared earlier, in PHANTASMAGORIA and in THE HUNTING OF THE SNARK). The grotesque Frost illustrations appear here for the first time. The dedicatory verse doubly hides the name of the dedicatee (Gertrude Chataway).~This is a near-fine copy (minor bubbling of the cloth, cover gilt less than bright). Williams Madan & Green 160. Le Musée de Marine du Louvre. Histoire-Description-Construction-Représentation statistique des navires a rames & a voiles d'après les modèles et les dessins des galeries du Musée du Louvre. 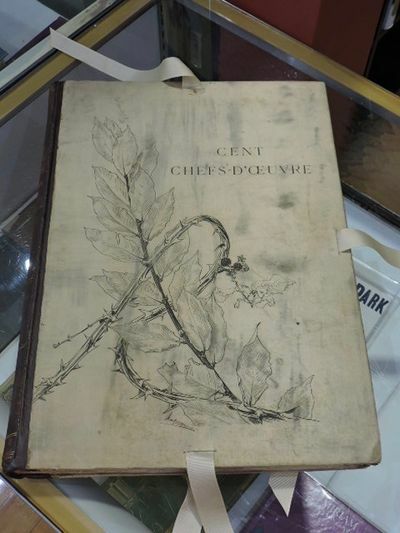 Avec 60 Planches phototypiques inaltérables et 200 Vignettes. Berlin. Die deutsche Kaiserstadt nebst Potsdam und Charlottenburg mit ihren schönsten Bauwerken und hervorragendsten Monumenten. Eine malerische Wanderung in Buch und Bild für Einheimische und Fremde. - Espasa y Compañía, Barcelona 1883. Holandesa. Cubiertas algo rozadas, interior en perfecto estado. Conserva todas las láminas. Contiene: I: Historia antigua y de la conquista. - II. El Vireinato. Historia de la dominacion Espagnola en Mexico desde 1521 a 1808. - III. La Guerra de Independencia. - IV. Mexico Independente 1821-1855. - V. La Reforma. T.I: 926pp+15 lámns; T.II:930+17lámns; T.III:810+15 lámns; T.IV:880+13 lámns; T.V:883+ 13 lámns. 34,5x26 cm. Pettenkofer, Max von, Chemiker und Hygieniker (1818-1901). Seeshaupt, 24. IX. 1883. - 1 S. auf Doppelblatt. 8vo. Wohl an den Schriftsteller Paul Lindau (1839-1919) in Berlin: "Sehr geehrter Herr! Unendlich habe ich bedauert, daß Ihr kurzer Aufenthalt in München Ihnen noch durch Unwohlsein behindert wurde. Ich komme nun Anfangs Oktober nach Berlin und hoffe, Sie wohl zu treffen. - Das Manuskript meines Vortrages für Nord u. Süd anliegend. Sie können ihn sofort drucken - nach Ihrem Ermessen in einem Hefte unterbringen. Entschuldigen Sie meine Kürze - aber ich bin eben im Einpacken für München begriffen [.]". Pettenkofers Aufsatz "Ueber Vergiftung mit Leuchtgas" (in Fotokopie beiliegend) erschien im Bd. 28, H. 82 (1884) von Lindaus literarischer Zeitschrift "Nord und Süd". - Pettenkofer begründete die Wissenschaft der Hygiene als Bereich der Medizin; zu seinen größten Verdiensten zählt die hygienische Sanierung der Stadt München. Er entwickelte den Fleischextrakt (die Liebig'schen "Suppenwürfel") und widmete sich der Epidemiologie. Dana Estes and Charles Lauriat. Good with no dust jacket; Library markings on spines, bookplates on front . pastedowns, perforated owner stamp on title pages, and notations on front . flyleaves. Some chipping and dampstaining to spine labels. Rubbing and . light wear to each volume, with some small splits at heads of several . volumes.. Hardcover. Published 1883-1887. Edition de Luxe. Introduction by J. P. Mahaffy. Translated by M. M. Ripley and W. J. Clarke. 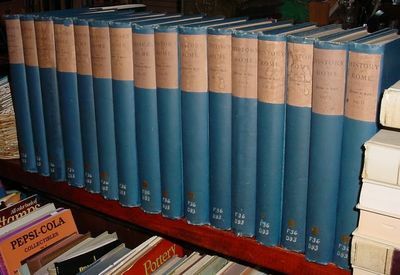 16 volume set (eight volumes issued in two sections each). 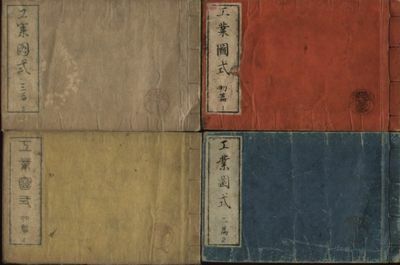 Navy cloth with paper spine labels. Top edges gilt. One of 1,000 numbered copies. Printed on linen vellum paper. Each volume contains an average 300 pages. The set contains over 3,000 engravings and lithographs, including maps, plans and chromolithograph plates of ancient Roman art, coins, sculpture, architectural landmarks, pottery and landscape views. Quitea handsome set overall. ; Ex-Library; 4to 11" - 13" tall . London: Longmans, Green, and Co.. 1883. First. First edition. Three volumes. 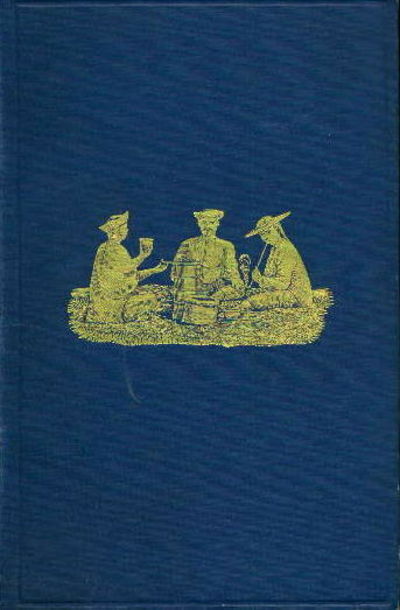 Publisher's smooth mustard-yellow cloth, covers ruled in blind, lettered and ruled in gold on the spine, light blue floral-patterned endpapers. London born Mary Bothmer, daughter of merchant John Young, married Major Count Hippolite von Bothmer, a German diplomat at Marseilles, and lived for a time in Germany. She published the popular German Home Life in 1876 and four novels. 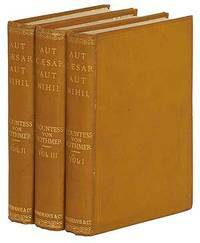 Aut Caesar Aut Nihil (Either Caesar or Nothing), her last novel, centers around the assassination of Tsar Alexander II in 1881. A handsome set in fine condition. Wolff 603. .